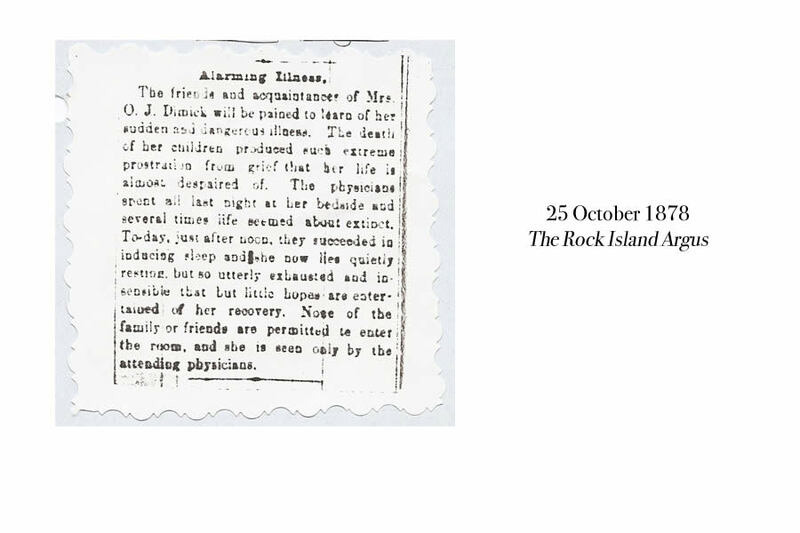 In the autumn of 1878, a diphtheria epidemic swept through Rock Island, Illinois, a community on the banks of the Mississippi River. 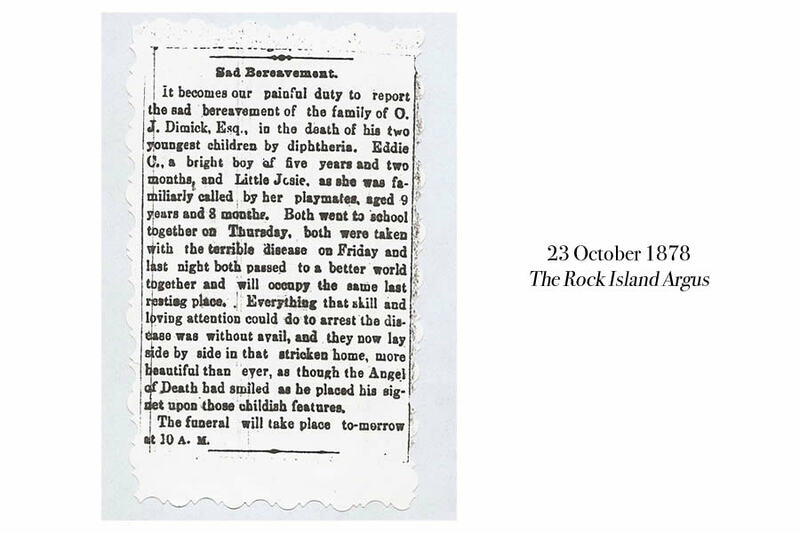 The brutal illness swiftly claimed the lives of many in this Midwestern town, including five-year-old Eddie and eight-year-old Josie, on October 22, 1878. It is said that they went to school together on Thursday, became ill on Friday, and died the following Tuesday evening. More than 130 years later, the children’s tragic deaths might have been forgotten if it were not for the loyalty of their beloved Newfoundland dog. The gentle giant was reportedly so grief-stricken by the children’s deaths that he daily followed the parents’ carriage to the nearby cemetery, where he lay on the graves from dawn to dusk. The cemetery was just under a mile (1 km) from the children’s family home. According to newspaper articles from the nineteenth-century (note: see clippings below), the animal made this daily commute for nearly two years. 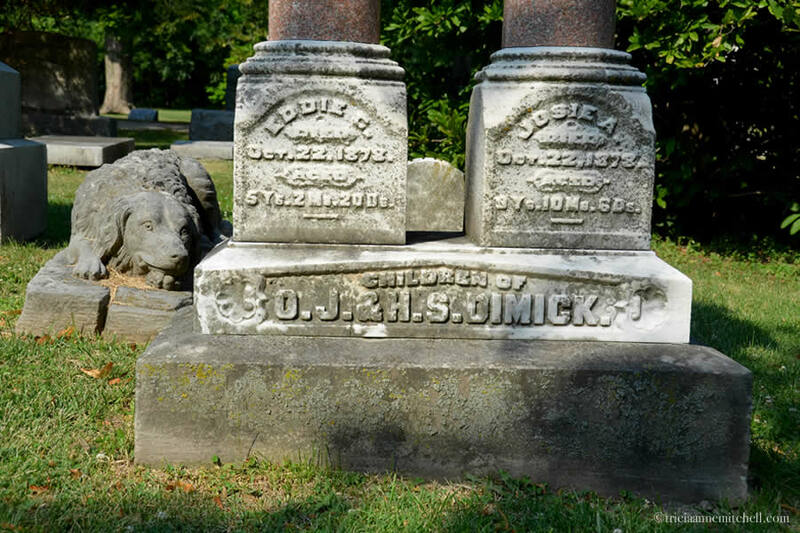 After the dog’s death, Eddie and Josie’s parents, Otis and Harriet Dimick, wished to bury the loyal pet besides their children’s headstones. 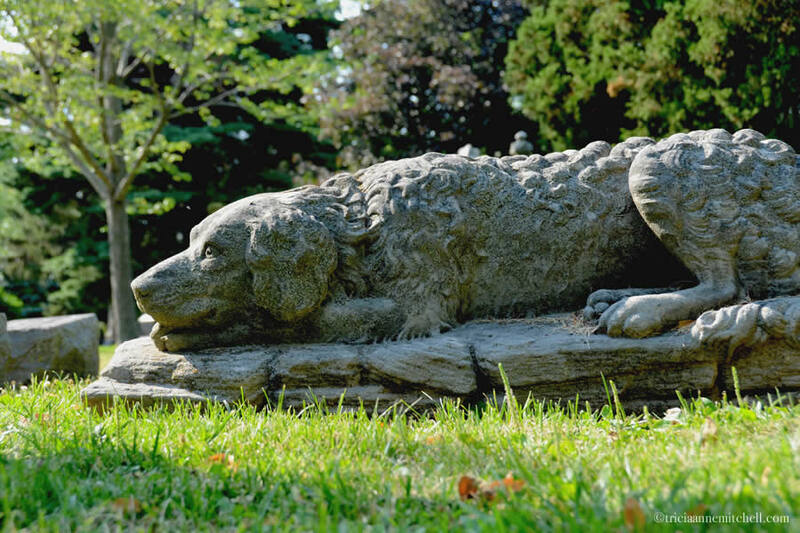 As cemetery policy prohibited this practice, they instead commissioned a Chicago artist to sculpt a life-sized statue of the dog, complete with swirly hair and mournful eyes. This likeness was then placed beside the Dimick children’s tiny headstones. I first learned of this poignant tale in 1988 when, at the age of eleven, I moved into the brick home that Eddie and Josie had inhabited more than a century before me. I had visions of discovered artifacts hidden beneath the creaky attic floorboards. I wanted desperately to unearth treasures in the soil of the rolling hillsides in the home’s expansive yard. Little did I know at the time, however, that the greatest pleasure would come not from antique material objects, but from researching the home’s inhabitants, something that I did with my mother. After scanning rolls of microfiche and faded pages of history books at the library, we were better able to piece together the lives of the Dimick children and their companion dog, whose story continues to touch passersby, more than a century later. I’ve heard several heartwarming tales about loyal pets, with the Scottish Greyfriars Bobby coming to mind. Do you have any anecdotes to tell from your region, or perhaps a story about your own family’s devoted companion? 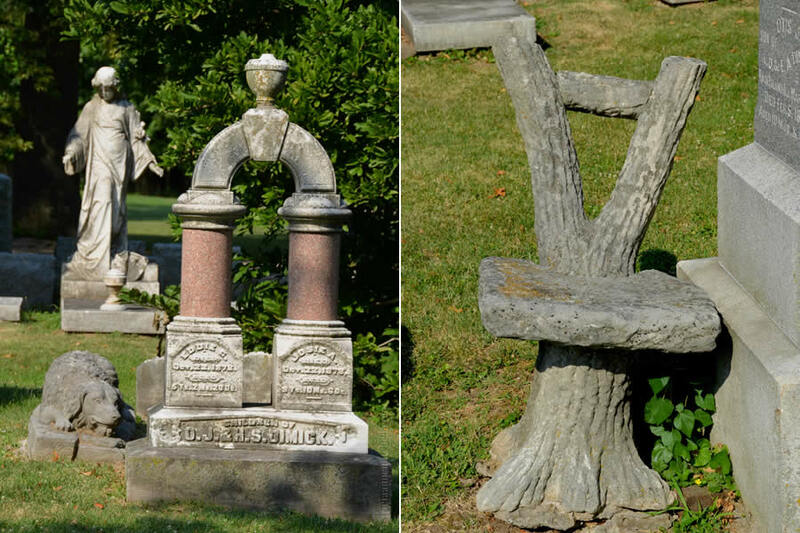 The children’s memorial (left) and on the right, a chair on the family plot resembling a tree trunk. 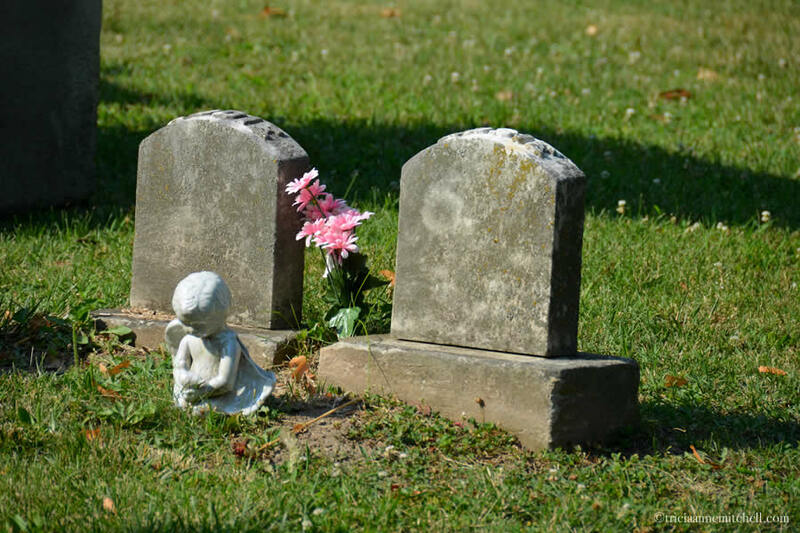 Though the family doesn’t have any known descendants in the area to tend to the graves, strangers still anonymously leave flowers and other tokens on the children’s graves. About thirty years after the Dimick family left the house that they had constructed in 1872, the structure became an orphanage. This picture was taken in the early 1900s when about 50 children lived there. Fast forward a few more decades, and my bedroom windows were in the upper right. 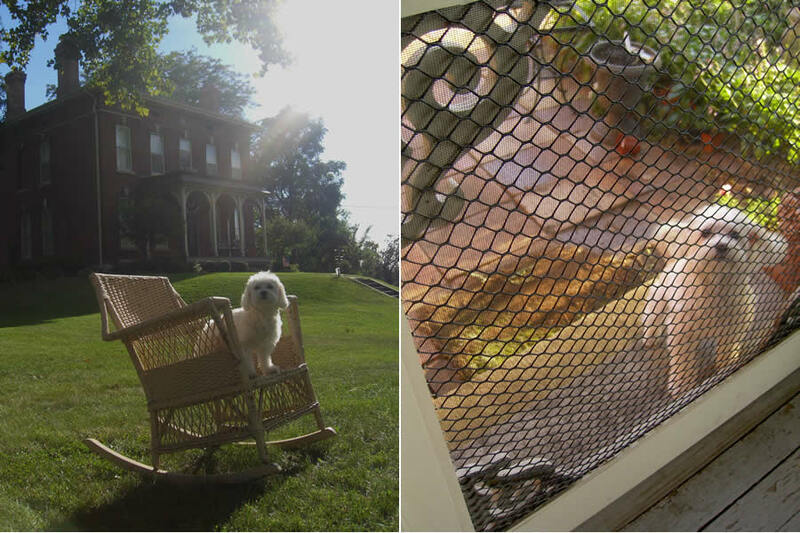 A number of family pets have undoubtedly lived in the Dimick House since 1872. Here is one of our canine companions, Meg. She was considerably smaller than the famous Newfoundland that was the first to live in the home, but equally loyal. 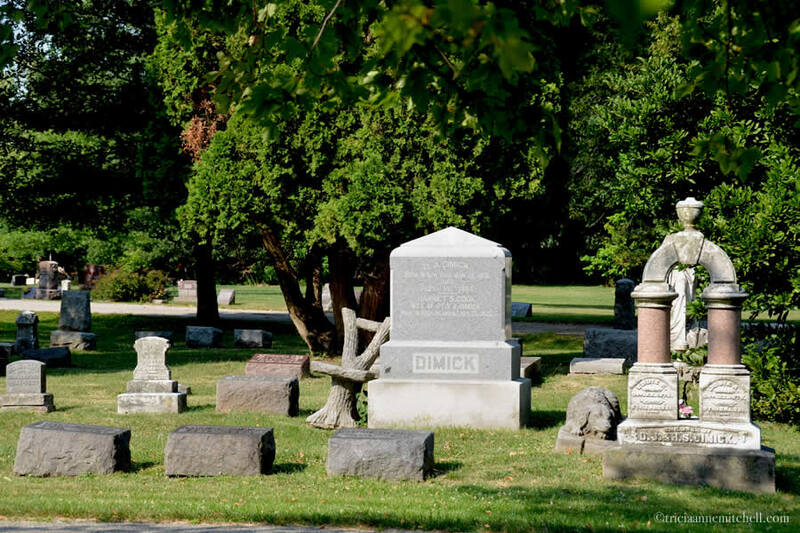 The Dimick family plot is located in the historic Chippiannock Cemetery in Rock Island, Illinois. 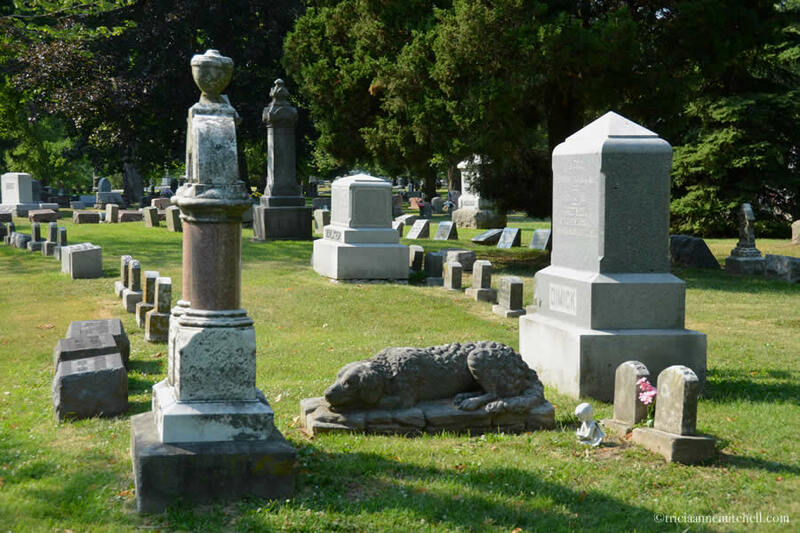 Visit the cemetery’s website, and inquire at the front gate to learn where the Dimick dog grave is. Opening hours are also noted there. 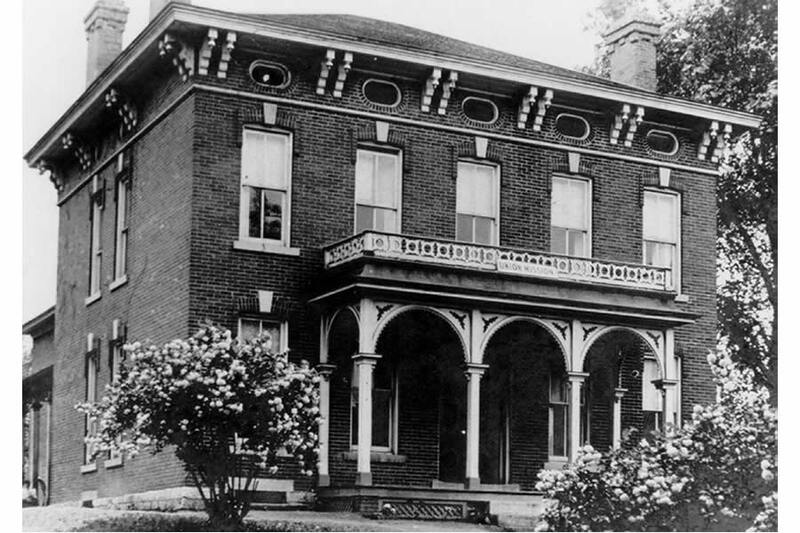 The Dimick family constructed an Italianate-style home in the countryside in 1872, and that is where Eddie and Josie lived and died. Today the home is now situated in the city at 1250 – 21st Avenue. I was lucky enough to live there between 1988 and 2001! 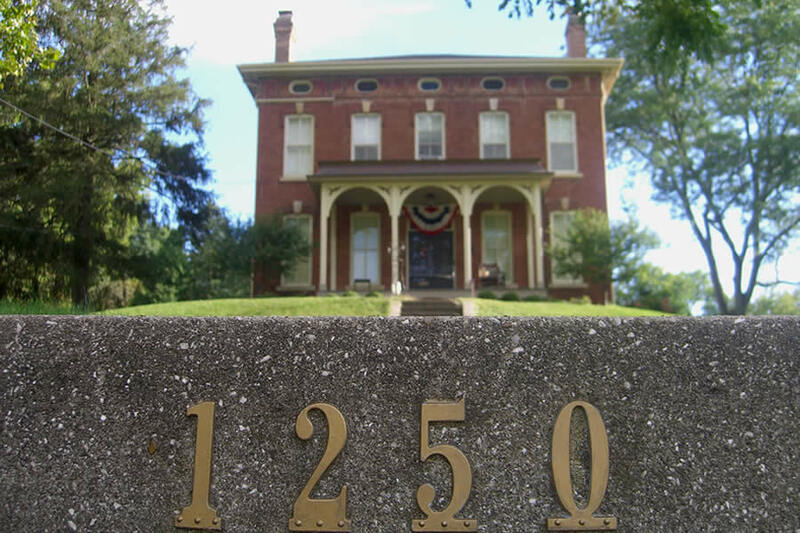 The home is listed as a Rock Island Landmark, thanks to its architecture and the notable families who lived there through the decades. We suspect that the dog was buried somewhere on the property, and despite much research, were unfortunately never able to find out the dog’s real name. 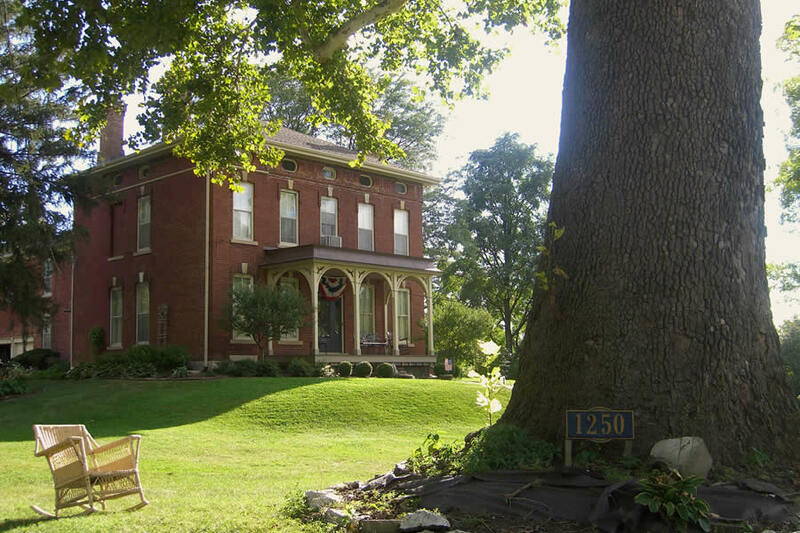 As my parents have now relocated to Germany, their beloved, historic home is now for sale. If you know of anyone looking for a home with a plethora of wonderful stories, please feel free to get in touch..
What a sad story ~ but so brilliant in it being heartwarming too, thanks for introducing this story so well through both your writing and photography. Just a fascinating piece of history, and it is nice to know that it is not being forgotten. Great post Tricia. What a heart warming tale of a dog´s devotion. What an interesting place for you to grow up in. Thanks for sharing. Darlene, happy to hear that you enjoyed the story. Indeed, it was fun growing up in a home with much character. Though we never found any great treasure hidden underneath dusty attic floorboards, or in the yard, the experience allowed my imagination to run wild. Once, friends and I even deposited our own time capsule into the yard. That chapter of my life inspired my appreciation of history. A beautiful memoir, Tricia, about your childhood home and the heartwarming events that took place there. And to think that it was an orphanage,too. Definitely, an historical landmark. Many years ago my husband was commissioned to carve a life size replica of someone’s family dog that had passed away. They just couldn’t bear that he was gone. Such love and devotion these animals have. Thank you for sharing. Lynne, thank you for your thoughtful comment, and for sharing your anecdote about Ron’s involvement in crafting a replica of a beloved pet. I’m curious what material he used – was it wood, or carved out of stone? He is a man of many talents! You can probably imagine how, as a child, I was intrigued by the old house’s history. My elementary-school friends were convinced the house must be haunted, and they tried to convince me to get a Ouija board. We didn’t ever do that, and I can’t say that anything frightening ever happened there (unless you classify regular bat visits and even a mole coming inside as being scary). But, I do remember one of our pet dogs staring at the high living room ceiling as if there was something we weren’t sensing. That’s such a heart warming story. There’s nothing like a dog. Agreed, Gerard. Dogs do bring much happiness into one’s life. We had two lovely little ones that also lived in this home. I wonder how many other pets lived in the home as valued family members before we moved there. Thank you for your comment, and enjoy the rest of your Sunday! What a beautiful home you spent your childhood. You must have so many memories, as your parents selling this home, I bet so many memories are coming up from your past. How wonderful you share them with the world. Thank you Tricia. Are you still in The States? You’re correct about many memories coming back, Cornelia! From sledding on the terraced hills to dancing on the front porch, many fun moments were had there. And yes, we’re still in the States – maybe that means we might be able to link up since we’re almost in the same part of the country. :) Thank you for commenting, and may your week start off in a sunny fashion tomorrow! This was such a moving story Tricia and you told it beautifully. I think it would make a marvellous children’s book if approached in the right way – how you lived there as a child and were fascinated by the children and their loyal dog. Thank you, Carol. I’ve pondered that idea for some time, wondering how to make it upbeat and age-appropriate for a younger audience. Perhaps someday. :) Some years ago, for a walking tour of the cemetery, local writers did write narratives, telling the stories of the well-known people who are buried there. Actors portrayed these ‘characters’ and little Eddie and Josie Dimick were featured during the event. Some daughters of family friends played the role of Josie through the years, and my mom was even able to locate a few Newfoundland dogs to stand in for the role of this noble canine. I can see the story in my head… I think it should be told from the point of view of you as a little girl being fascinated by the children who lived there and looking for the treasures they might have left behind. Maybe we should co-write it! Lol. Awww. Heartbreaking. That newspaper obituary made me feel like this just happened. And to think that you lived in the house where they did. Makes it all the more personal. I love the dog statue. 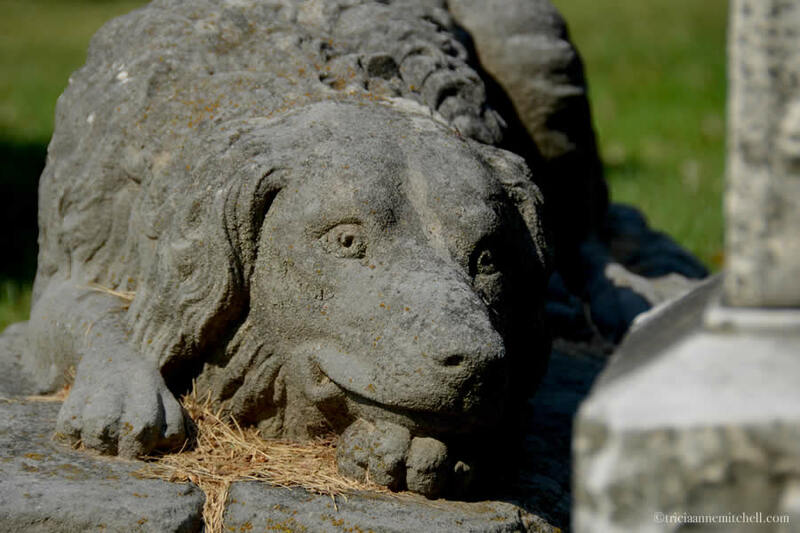 It’s coincidental — I will be posting about another dog headstone erected in a cemetery here in Ohio that also makes you want to cry. Thanks for sharing this! Juliann, the writing style in the obituary of that time has a different feel to it – more descriptive and sentimental, I think. 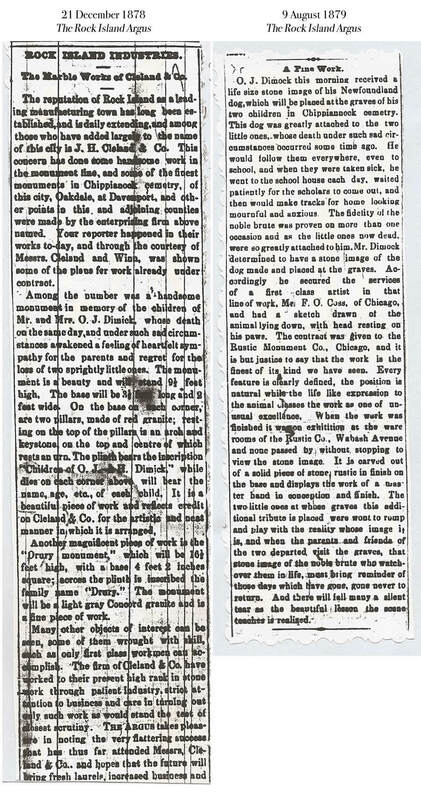 The other two longer clippings describe the dog statue’s commissioning, and its eventual arrival from an artist’s studio in Chicago. Indeed a glimpse into the past. As I was doing research for this piece, I discovered that there are a handful of such tales around the world, attesting to the loyalty of animals. It’ll be interesting to see your Ohio version shortly. I was enthralled till the very end! Truly an intriguing and beautiful story. Love that you and your life in that gorgeous house is the next chapter! I’m thrilled that you enjoyed the story of this gentle animal. Thank you for reading! Oh wow, now I understand better where your perspective was when you wrote this. Selling a home is so emotional – I am glad that the blog can help you at least a bit with the process. Yes, you and your family will always be an important chapter. If only we all had the opportunity to be a part of a home with such a special story! What a captivating story Tricia and I love the way that you told it. So glad that you have been able to keep it alive and it won’t be lost as the home moves on to it’s new owners! Thank you, or rather dziękuję, Traveling Rockhopper. :) Happy that you enjoyed it! Having a dogs company is life’s most pleasurable experience. This is a wonderful heart-warming post. I’m sure the Dimick Siblings and thier lovely pet would be happily playing somewhere in heaven. Having grown up with some special dogs, I have to agree with you, fromtopview. 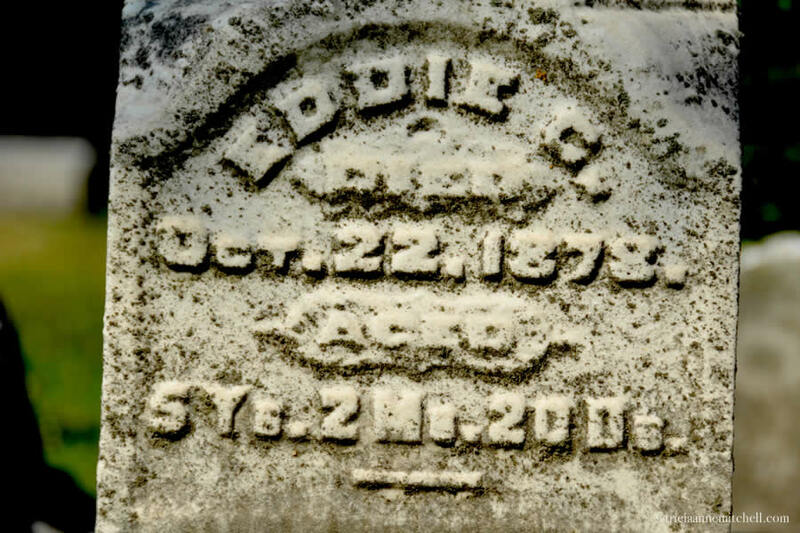 It’s been more than 130 years since the Dimick children died, but I’m glad to hear that the tale of their loyal dog continues to touch people. Thank you for your comment. This story was told in a nursing school by an instructor who was teaching the nursing students about the vaccine for diphtheria. I heard this story years ago and I was heartbroken. I have never seen the house they grew up in though. Thanks for all of this. It is very touching. Susan, it’s interesting to hear how much reach this story has had. Do you know if the nursing school was in the Quad Cities (the area where the children lived)? Back when I lived in this Rock Island house, my mom and I did a bit of genealogical research on the family. We had hoped to find photographs of the children, and perhaps learn the dog’s name, but weren’t successful. 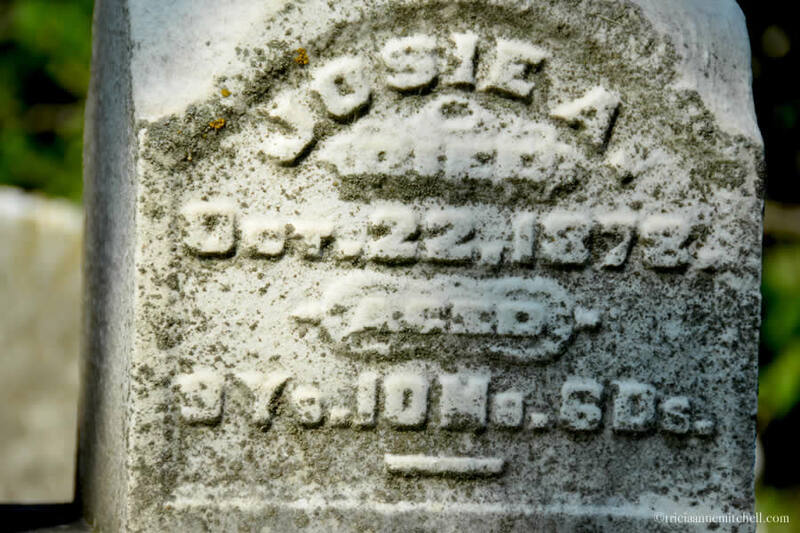 We did connect with some distant descendants of the family, who were now living elsewhere in the Midwest, and even they had never heard this story about their relatives. Thank you for your message, and for adding to the story!